Hello there! STAMPtember is in full swing and today is actually the first collaboration day when Simon releases a special limited edition set designed by a different company and today its Lawn Fawn. 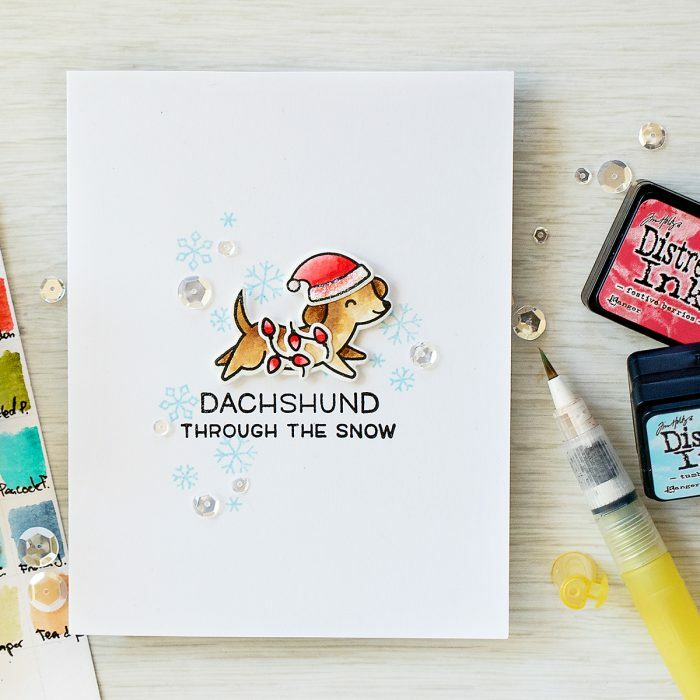 I am a big fan of Lawn Fawn, I adore their interactive cards, so I was thrilled to see their Happy Howlidays set and better yet – play a bit! 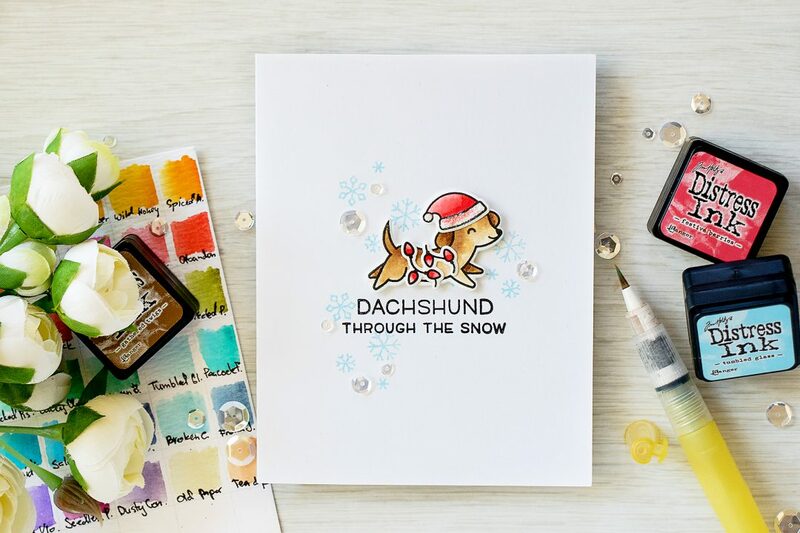 To create this card I first stamped several images from the Happy Howlidays set in VersaFine Onyx Black ink onto watercolor paper. I went with Distress inks and did some quick coloring using a water brush. The colors I used are Gathered Twigs and Festive Berries. I die cut the images out using matching dies and added a layer of Star Dust stickles to the Santa’s hat. 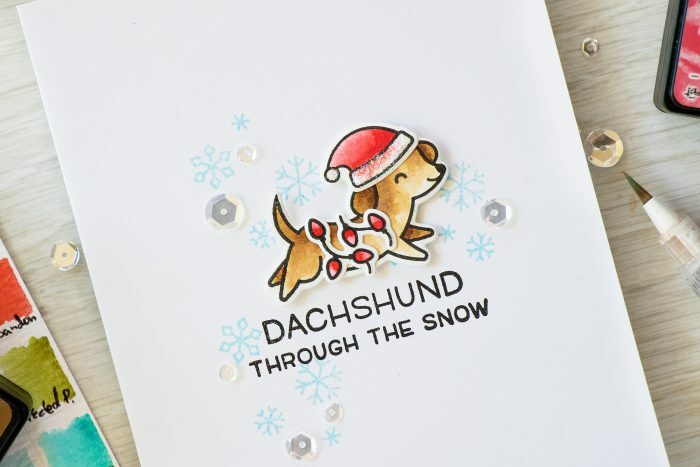 I wanted to keep this card very simple so that the focus would be on the adorable pup. I stamped my sentiment using same black ink onto an A2 card base made out of Neenah cardstock and also added several snowflakes stamped in Tumbled Glass Distress ink. 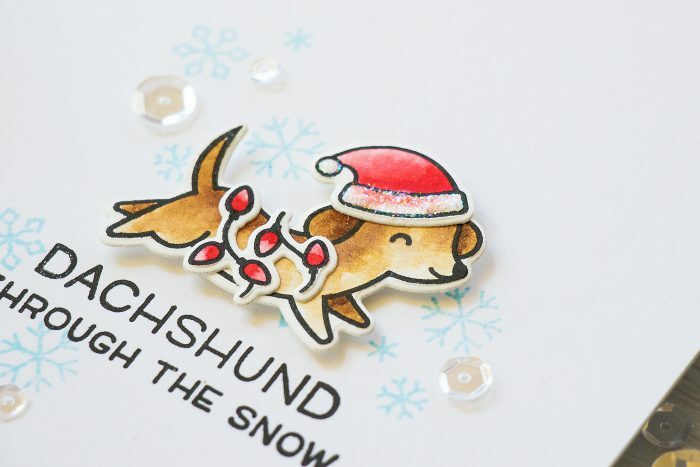 Lastly, I foam mounted my holiday Dachshund using a thin pop dot and added a few sparkling clear sequins from Pretty Pink Posh. Such a clean and adorable card! Love this pup! Your card is so cute Yana ! This stamp set is definitely adorable ! Love your very CAS layout ! Thanks for sharing. Such an adorable CAS card. I love the lights around the dog. This is soooo cute !! I like how you embellished the card ! This card is really pleasing to the eyes ! your other cards are cool , too, but this is my favorite! Thank you for sharing !! Oh my goodness Yana, this is too stinking CUTE! Lovely card design and the watercolor card is so striking. The k you for sharing your coloring techniques. Love your watercolor card, the colors you used were do vibrant. Perfect holiday cards. I love this card, it’s so cute.